Well forget that new rod this year, just get a custom high-end SUV built for fly fishing anglers. I think one in green would match my waders. 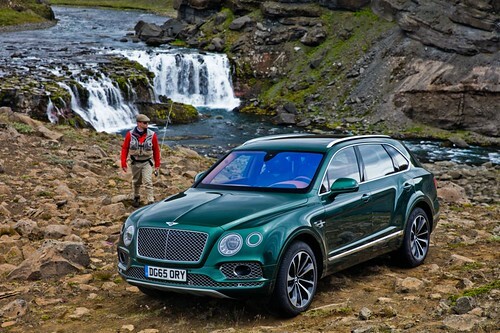 Bentley has created the ultimate angling accessory; the new Bentayga Fly Fishing by Mulliner. Hand-crafted by Bentley’s bespoke coachbuilding division, the Bentayga Fly Fishing by Mulliner is an exquisite installation which houses all the equipment required for a successful day on the river. Four rods are stored in special tubes trimmed in Saddle leather with Linen cross-stitching and located on the underside of the parcel shelf. A pair of landing nets in matching leather bags are stored in a bespoke, carpet-trimmed hard pocket built into the side of the boot. 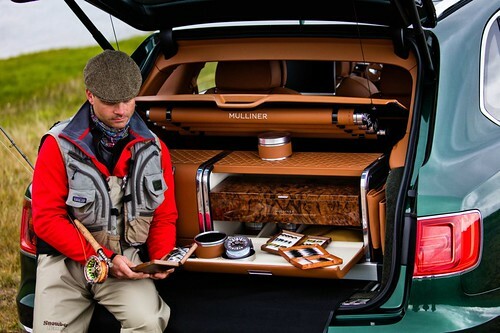 At the heart of the Bentayga Fly Fishing by Mulliner are three individual, Saddle-leather-trimmed units: a master tackle station; a refreshment case; and waterproof wader-stowage trunk. The master tackle station and refreshment case sit on a sliding tray that allows for easy access. Inside the master tackle unit is a special Burr Walnut veneered drawer containing a fly-tying vice and tools, as well as a selection of cotton, hooks and feathers. Beneath this are four machined-from-solid aluminium reel cases trimmed in Saddle leather with a Linen cross-stitching. The interior of the refreshment case is trimmed in Linen leather, and contains up to three metal flasks and a set of Mulliner fine-china tableware, as well as a separate food storage compartment. With a quilted leather finish on top, it can also be removed entirely and used as additional seating. Waders and boots are conveniently stowed in a hand-crafted and Saddle-leather-wrapped wood trunk, lined with hard-wearing neoprene material to keep the items in a waterproof environment after use. Of course, all three units can be removed from the Bentayga’s boot whenever maximum luggage space is required. Waterproof boot-floor and rear-sill-protection covers are discreetly integrated into the rear of the Bentayga Fly Fishing by Mulliner, as is an electronic dehumidifier unit to ensure the area remains fresh and dry. For the first time with Bentayga, Mulliner ‘Welcome Lights’ are also featured. These are built into the underside of the doors and project the Bentley and Mulliner logos on to the ground when the doors are opened. In addition as a bespoke option, any personal logo or graphic can be individually specified on a customer’s Bentayga order. If you have to ask...well you know the answer. One of the first useful websites I found for anglers on the Internet was the USGS Water Data site. The website provides real-time streamflow conditions for over 9,000 streams and rivers across the country. Detailed information about stream discharge levels and water gage level heights are provided. 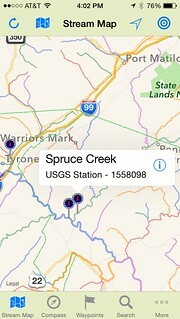 The USGS has just started a beta (early release) version on the web for mobile users to get easier access to the data. 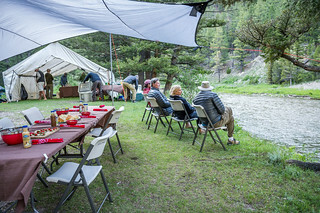 The desktop version has always been an incredibly useful trip planning tool for me before I headed out on fly fishing trips. Nothing worse than driving flippin four hours to that great mountain stream for the weekend only to find out that it blown out along with ten surrounding counties that looked like a hurricane just rolled thought the region. 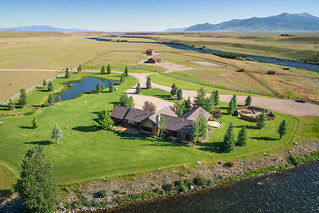 I use this almost every time I go fly fishing and have changed my plans by hundreds of miles based on the reliable data from this web site. Sometime those plans involve me just driving to a closer bar, but it works. 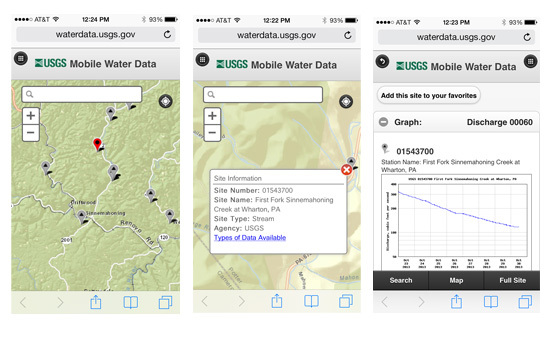 The new mobile site is pretty straight-forward to work with and can be found here: m.waterdata.usgs.gov. No need to install any app, just point your browser to the url and you are good to go. Right away it feels like it was designed to be navigated with you just the use of your index finger. That is good because the other designed point for the site is for it to work with newer smart phones. A data connection and browser on your iPhone or Android based phone is really all you need. Works with my iPads and other tablets as well. The USGS does mention that it may not older devices or older browsers. 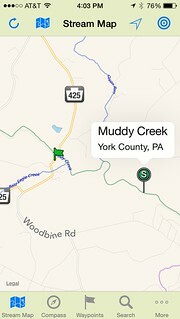 I found the mobile site is very responsive and with very detailed terrain map as the base. The graphs show a seven day view at the gauging station, which can show if the water is going up, down or staying the same. Knowledge of the stream discharge levels does help indicate if the stream is high or low. Hope in future updates they provide some access to selective date ranges of the stream gauges like in the desktop version. Right now they are only fixed on the last seven days. Nice new update from the USGS! The full USGS Water Data for your desktop computer can be found here. The claim that any book is “definitive” has always caused me to dismiss the reviewers glowing claims that inevitably follow – and I’ll not use the term in this review – but Fly Fishing for Striped Bass by Rich Murphy comes close to meeting this ideal. I’ve had the pleasure of chatting with Rich at the Somerset show in the past and marveling at his beautiful and innovative fly patterns. When I asked him if he’d ever caught a tautog on a fly (something I’ve tried to do for years, without any luck) he responded with a tone suggesting that it was downright easy. Looking at his crab patterns, it doesn’t surprise me that ole Mr Tog would fall for ‘em. Anyway, this book, is simply put, a pleasure to read or just peruse. Replete with color photos on every page, it’s a coffee table book that reads just as well. In its 9 chapters, FFfSB starts with an intriguing chapter that follows the migration of “Sax,” a fictional, fifty pound cow bass on her migration up the coast. We know from Chapter 2 that a major physiological change happens in her eyes at sundown – the color receptors or cones on the surface of her eye’s retina retract and contrast detecting receptors, or rods are deployed in their place. This enhances her capacity to detect subtle changes in the contrast gradient of the water column around her caused by the movement of her prey or predators…My surface night patterns are configured to generate a significant and/or unusual acoustical air/water intersurface rip, and like my subsurface patterns, to develop a long and sinuous horizontal profile to as maximize their silhouette against the night sky. If you can get past some of this wordy verbiage, however (Tom Pero admits that editing the book was a challenge), there is a tremendous amount of useful information. I particularly found his water temp charts by season to be fascinating. Murphy also covers fly fishing the coast of California for stripers, a region often overlooked in other striped bass fly fishing books. This is a big book and not cheap to buy but I’d highly recommend it, especially if you’re a bit past the stage of beginning striper angler and are looking to learn some more innovative tactics and outside conventional fishing methods. My old felt wading boots of six years were getting a little long in the tooth this past winter. With Maryland and other states banning felt soled boots it seemed like a good opportunity for some new boots. I picked up the Simms Guide Boot at the Fly Fishing Show at Somerset from TCO Flyshop. I have had plenty of time in these boots over while in the past few months. The Vibram rubber soled StreamTread with HardBite Star Cleats are awesome! I was really worried this combo could not stack up to my old felts and studs, but not so. I could get around easily even during the high waters this spring on the Little J and First Fork. The leather construction is very solid. 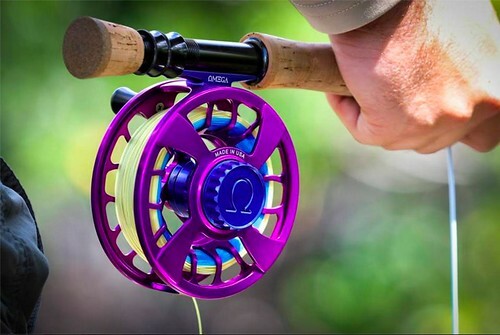 Simms put a lot of time into the design of the support and you can really feel the difference. The Simms Guide Boots are easy to put on and feel great even have been in them for all day. I really like the speed lacing design and quality of the of the laces. Seems small, but my old boots the laces always seemed to come undone. Really unmatched quality in the construction and comfort these wading boots provide. Net Net: Awesome boots, worth the investment and get the HardBite Star Cleats. Last fall I decided to retire my old vest. Not that new things are always better, but my approach to fly fishing had change since I purchased my old vest 20 years ago. More recently I find myself hiking into many spots and need to be a little more nimble. I am not fooling myself, I do realize nimble and me parted ways many years ago. Damn carbs! It seemed I was overstuffing my vest with loads of fly boxes and too much extra gear. Quite frankly casting was a bother as I had eight - ten different boxes crammed in all over my vest. One big final new requirement was being able to bring my camera and reach it with relative ease. Of course I did a lot of research on the Internet and ultimately made my way to over to a fly shop and get the touchy feely thing going. Stopped into TCO Flyshop while on one of my daughters college road shows (please pick PSU, please pick PSU) and got some help from Chris. He was a big help and I settled in on the William Joseph Confluence chest pack. Now this pack has been out for a couple of years, but I still get asked a lot about vests and chest packs. The front of the pack has plenty of room for all my essential small gear. The zippers are awesome. Nothing worse than trying to keep things contained and getting held up on stuck zipper. In the front zippered section I can load up plenty of spools of tippet, split shot, a small knife and sunglasses. The main front compartment is designed for fly storage. William Joseph provides a foam fly holder, which I keep loaded with several of my go to flies, nymphs and streamers. About the only thing I didn't like with the pack is the mesh that is inside this compartment to separate items like fly boxes and the foam board. Often the flies on the foam would easily fall off and get stuck in the mesh separator. There is room for a couple of fly boxes. I think I found myself with three of varying size in the front. Two zingers and small side pockets were well thought out. The back compartments had plenty of room for my camera, rain gear, and an extra fly box or two. Most importantly I could unbuckle the side straps and spin the pack around to get to these items. I used to pull my arm out of its socket trying to get my camera in the old vest. I found the pack very comfortable even in the warm months and easy to move around. Casting is much easier now. What has worked best is the convenience of all my essential flies and gear right in front of me easily zipped up and secure. The 2011 Confluence Pack will be continued with a few minor upgrades. Mostly the front pockets will have new earth magnets holding the pockets together instead of the zippers. Pretty cool!